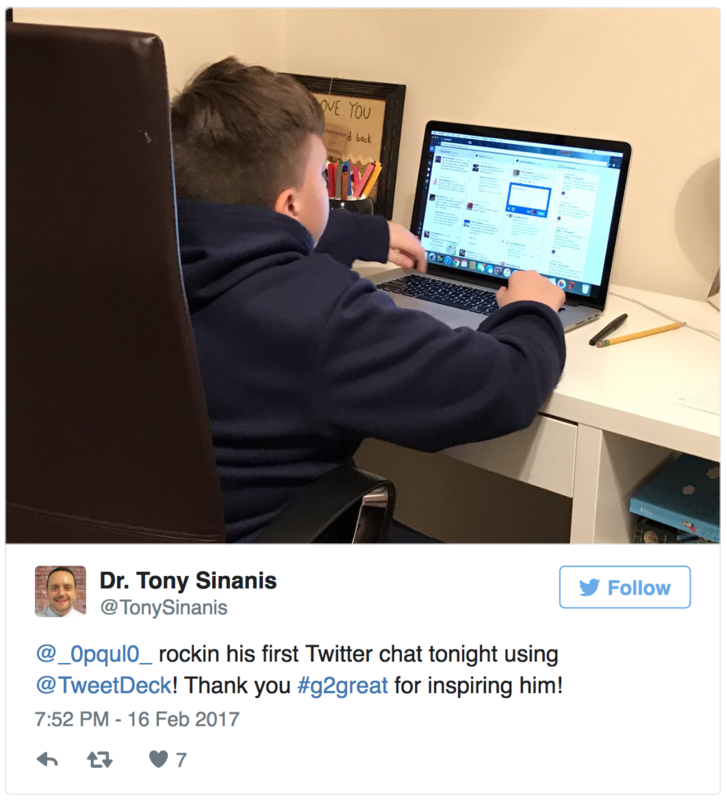 I’ve long been a fan of principal Tony Sinanis, spending hours savoring his words in remarkable tweets, book, blog, and even a #G2Great twitter chat on leadership. Shortly after reading Tony’s exquisite post, Let’s Not Kill a Love of Reading, I received an email alert of a new post. I opened his blog in joyful anticipation and to my pure delight I discovered exquisite post number two written by his middle school son, Paul, Yes I Love to Read. In an instant, Paul’s post made me an official fan club leader of two members of the Sinanis family! There’s no question in my mind that the educational universe is desperately in need of enthusiasm only young people like Paul can bring to the learning conversation. When students and educators come together to initiate collective dialogue, this collaboration can maximize our efforts to do our best work in their name. After all, who better to view our teaching from the receiving end than students? #G2Great is so committed to bringing student voices into the conversation that we have previously spotlighted the gifts of Eden & Ella of #Kidsedchatnd and Sam Fremin of #TheBowTieBoys (the entire #BowTieBoys team will honor us on #G2Great 3/16/17). While Paul’s blog post captivated my heart, it also broke my heart to read the words no teacher should ever want to read about the impact of their instructional choices. 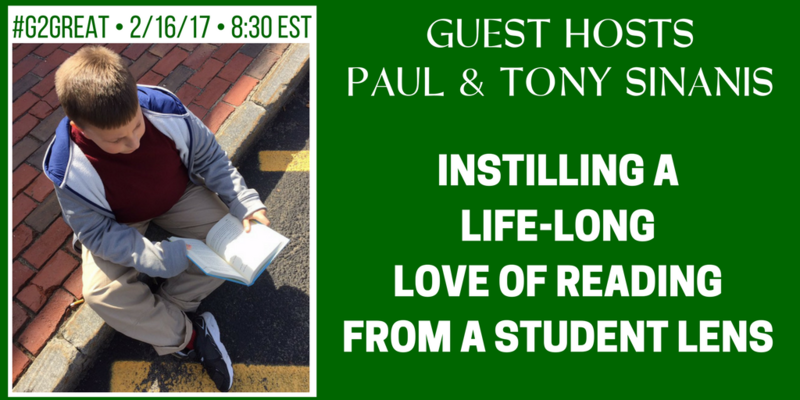 Sadly, I have seen the love of reading hijacked in far too many classrooms and I can’t help but worry how many students share Paul’s feelings. Quite frankly, we should all be horrified that any child walks away from their school experience with such feelings. Well, shouldn’t we? We owe it to all of the Paul’s of the world to make the choices that will instill a life-long love of reading, especially in an age where reading for pleasure seems to be pushed to the values sidelines, crowded out by a laundry list of so-called priorities that pale in comparison. We have an abundance of research on the critical role of authentic reading with incredible authors leading the way such as Donalyn Miller, Penny Kittle and Terry Lesesne who have made it their life work to spread this message. Yet, far too many students are still slipping through the love of reading cracks. Why? Before we even consider the WHAT and HOW of reading, we must first identify our WHY. Purpose, or what we view as the ultimate goal of reading beyond our lessons, is the driving force of all we do. WHY gives us a sense of direction that will keep us from veering off the life-long reading path. 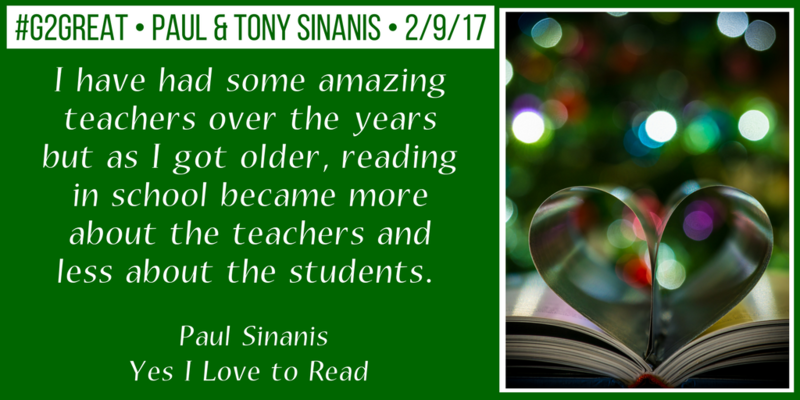 As Paul and Tony so eloquently reminded us, instilling a life-long love of reading is the foundation upon which all else resides. This is not separate from our instructional goals but could breathe new life into those goals. Without WHY we are simply “DOING” reading while keeping WHY at the center squarely focuses our efforts on students “BECOMING” readers who see reading as a purposeful and pleasurable pursuit both in and out of school. We need learning experiences where teachers and students alike see reading as an event that can support and extend our lessons while serving to beckon our students into life-long reader ‘becoming.’ Don’t the Paul’s of the world deserve that? But acknowledging WHY is not going to matter much if we aren’t willing to back this belief up with the gift of time no matter how busy we are. When we view instructional pursuits as more relevant that emotional pursuits rather than as two inseparable goals, reading as a joyful event will be first on the priority chopping block. The issue isn’t that we don’t have time but that we choose to use that time in less meaningful and purposeful ways. If joyful reading takes a back seat to STUFF – well, then we’ve misplaced our priorities and cheat children out of their birthright of BECOMING readers. We make room for authentic reading by giving it a place of honor in each learning day and then steadfastly avoid usurping precious time for reading as a purposeful pursuit by refusing to do anything that turns it into a trivial TO DO list. In other words, we celebrate each child’s journey to ‘becoming’ as we put instillling a life-long love a reading at the top of our priority list. Don’t the Paul’s of the world deserve that? Once we know our purpose and are inspired to find time in the day to honor our WHY, we then acknowledge choice as a co-contributor of life-long love of reading. We ensure that students have access to a wide range of texts and allow them to choose books that have the greatest potential to inspire them in this journey regardless of reading level. We know that books entice our readers and open the door to a love of reading so we happily immerse them in a wide range of beautiful options that will make their hearts sing across their school reading histories. We also know choice is not limited only to books students read but to what they do with that reading. This means that we refute activities that reduce reading to a trivial task such as assigned questions, reading logs, worksheets, and mind-numbing joy-robbing stop and jots. Rather, we opt for the very experiences that are afforded real life readers such as collaborative dialogue, book sharing, and student-centered inquiry. Don’t the Paul’s of the world deserve that? I must say that I am still basking in the glow of watching this incredible father-son team in action this week. 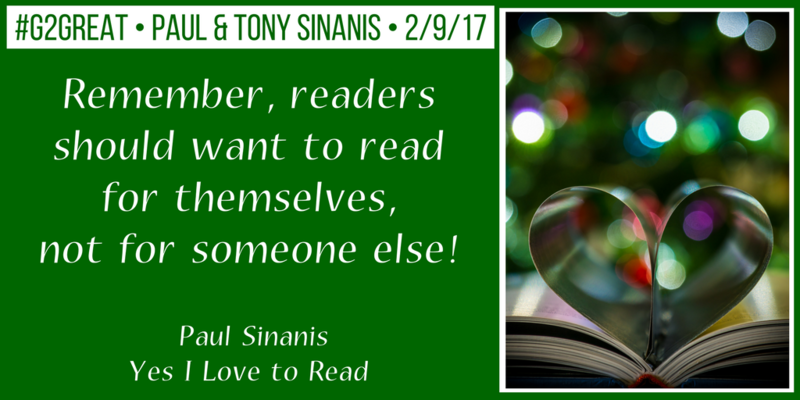 Tony and Paul clearly share the belief that instilling a life-long love of reading matters. This was evident in their tweets as well as the tweets of those who were inspired by them. Imagine the global impact we could have if we all join forces to spread this message and make instilling a life-long love of reading a priority everywhere. What if we screamed this message from the highest educational rooftops in our schools, in blogs, on social media and to anyone who is listening? I think the Paul’s of the world deserve that! We look to our students because they are the recipients of our efforts to achieve their rightful status as life-long readers. We look to our students because they have unlimited passion and enthusiasm that would spark our passion and enthusiasm. We look to our students because they are the mirror that reflects how we are doing so we can do better. We look to our students because they have wisdom that could elevate our efforts. We look to our students because we know our actions have a lingering impact. We look to our students because they deserve to enter and leave our classrooms holding tightly onto books that envelop them in a warm blanket of life-long love of reading. We do all of these things because we believe deeply that our students deserve joyful reading long after they leave us and that we can be the impetus that will maximize that potential for every Paul we are lucky enough to have in our professional care. And yes, I think they deserve that! We are listening and we are forever grateful for your heart and wisdom! Wow! Wow! Wow! Thank you for this post and the simple reminder of 3 goals: purpose, time, choice. Guiding children to books and love of reading — now THAT’S a class I want to teach!